Jauan Jennings' leaping catch of a Hail Mary pass to lift Tennessee to a 34-31 win over Georgia last season will be remembered as one of the greatest plays in Volunteers history. The legacy of the player who made the grab is still a work in progress. Jennings, back for his junior season, is the Vols' leading returning receiver and is poised for an even bigger season in 2017. It will be hard for him to top the dramatics of the Georgia Hail Mary and a key touchdown catch in a win over Florida last season, but he could improve dramatically on his season total of 40 total catches. Tennessee's new quarterback will likely look Jennings' way often as the Vols replace three of their top five pass-catchers. Josh Malone left early for the NFL draft, and so did running back Alvin Kamara, who had 40 receptions. Senior tight end Ethan Wolf is a tested pass-catcher with 66 career grabs for 737 yards and four touchdowns. After that, it will be up to injury-prone fifth-year senior Josh Smith and a group of sophomores to pick up the slack. Tyler Byrd, Marquez Callaway and Brandon Johnson flashed playmaking ability in limited action as true freshmen and are likely to see their roles increase this year. 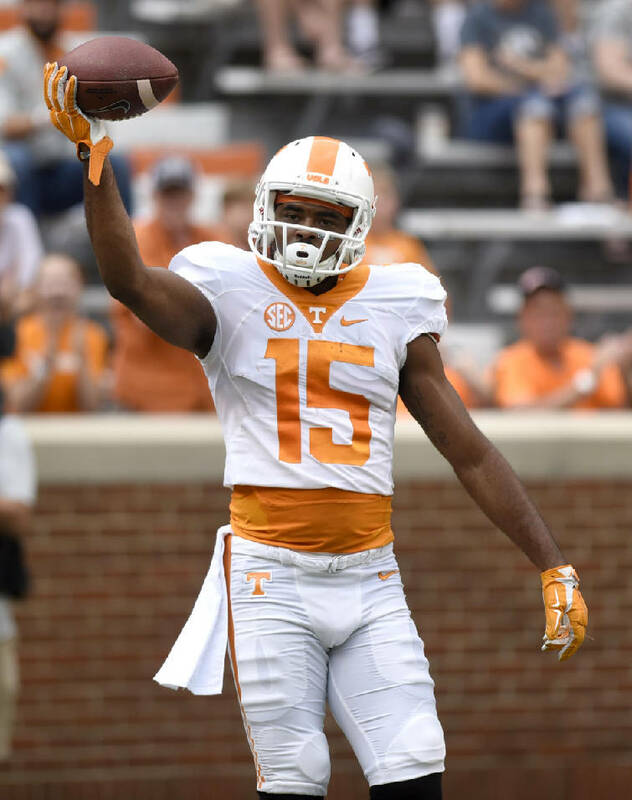 Jauan Jennings (15) shows the ball after catching a touchdown pass. The annual Spring Orange and White Football game was held at Neyland Stadium on April 22, 2017. Tennessee got a handful of receivers in the 2017 signing class, though it's not clear if an immediate contributor will emerge from the pack. Princeton Fant, Jacquez Jones, Jordan Murphy and Josh Palmer were three-star prospects and will get chances to show their skills beginning Saturday, when preseason practice begins. James Brown and Austin Pope are true freshmen at tight end, while Austin Pope will be a redshirt freshman at the position. One player to watch could be Latrell Williams, a redshirt freshman who was clocked at a lightning-fast 4.27 seconds in the 40-yard dash in high school. Tennessee head coach Butch Jones frequently talks about the need for competitive depth. It's imperative, he believes, to have a deep well of talented players who can push each other in practice as they compete for playing time. Having several freshmen and sophomores jockeying for roles in the offense at wide receiver should benefit the program in the long run. Wolf is poised for his biggest year yet at tight end after sharing receptions last season with the departed Jason Croom. With a good year, he could play his way into being a 2018 NFL draft selection. Tennessee has speed at the receiver position but could benefit from the emergence of another player with size. At 6-foot-3, Jennings is a sizable target. But he's not especially fast by Southeastern Conference standards. Malone's early departure hurts, because his combination of size and speed made him a constant big-play threat and a tough matchup for opposing defenses on the outside. Callaway and Johnson are both 6-2 and will need to demonstrate during preseason practice that they are ready for an increased role in the offense.